This practice utilizes a range of pasture management and grazing techniques to improve the quality and quantity of the forages grown on pastures and reduce the impact of animal travel lanes, animal concentration areas or other degraded areas. Prescribed grazing can be used to implement several invasive plant management options as well as to maintain productive grazing efforts. While traditional grazing practices are often blamed for promoting plant invasions, prescriptive grazing can be used to control invasive plant populations and enhance desirable vegetation conditions. Moderate. Prescribed Grazing can be applied to pastures intersected by streams or upland pastures outside of the degraded stream corridor (35 feet width from top of bank). The modeled benefits of prescribed grazing practices can be applied to pasture acres in association with or without alternative watering facilities. They can also be applied in conjunction with or without stream access control. Note: MDA estimate seems high for an annual practice. Therefore, it has not been included in the average. Prescribed grazing may be applied alone or combined with other management methods. When applied alone, the effects of prescribed grazing can be very slow to appear and often require repeated treatments over several years to effectively suppress most target plant species. Integrating prescribed grazing with other plant management methods can mutually enhance each method and can produce more rapid, long-term effects than the same methods used alone. Prescribed grazing is considered a holistic practice to reducing carbon emissions as a healthy ground cover assists soils in carbon storage capacity. 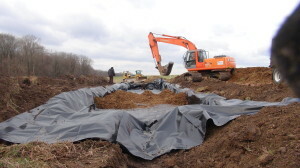 With heavier precipitation events predicted with climate change, a continuous (or near continuous) ground cover will protect soil resources and reduce nutrient transport. Rotational grazing has been shown to sequester 440 pounds of carbon each year. Prescribed grazing should be used sensibly, with careful consideration of its compatibility with the habitat, land management goals, infestation characteristics, livestock needs and resources available to implement the program. Achieving this goal requires extensive knowledge and solid understanding of how invasive and desirable plant populations within an ecosystem will respond to a particular herbivore’s grazing behavior. Pastures under prescribed grazing systems are defined as having a vegetative cover of 60 percent or greater. Not all ecosystems are compatible with grazing. Plant communities in two different ecosystems may respond very differently to the same grazing prescription. Likewise, grazing patterns and their influence on plant communities vary with different types of herbivores.